(Left) For R&D, chef Walker read books like The Indian Cooking Course by Monisha Bharadwaj; (Right, clockwise) Thali, a traditional metal serving dish, holds makhani murgh (butter chicken), tamarind and green chili chutneys, pickled cauliflower, pumpkin raita, roasted brinjal chutney, and ghee-brushed garlic naan. In its previous incarnation, Tu—sister restaurant to chef Joshua Walker’s Xiao Bao Biscuit—had been something of a risk-taking experiment. The globe-trotting menu featured dishes like king mackerel crudo topped with “cheese ice” alongside shrimp hush puppies or beef agua chile—perhaps too broad a culinary cosmos to satisfy both kitchen and customer. So in January, chef Walker, along with co-owners Duolan Li and Joey Ryan, pivoted their menu to rest solely in the subcontinent of India. A smart move given the dearth of well-executed South Asian-inspired restaurants in Charleston and the overwhelming desire for such big, bold (read: ethnic) flavor. At Tu 2.0, Walker takes different risks, curating a set of dishes from the most populous democracy in the world. But as a statement on Tu’s website articulates, Walker is cooking his version of the country’s vast regional cuisines, staking no claim to “authenticity.” This is a slippery word often bandied about without necessary nuance, specifically when chefs serve food to which they hold no inherited cultural ties. But as long as one is studious in their efforts and enters that cuisine respectfully, I’m game. What we consider Indian cuisine in the States is largely similar to our experience with Chinese food: takeout or buffet-style outfits, softened for mass American appeal. One could argue that most Indian fare in America is uncharacteristic of “true” Indian cuisine—if such a qualifiable thing exists. 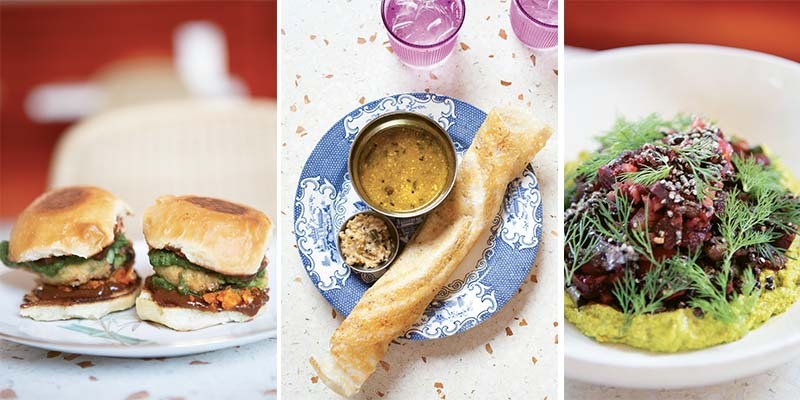 (Left to right) Vada pav (potato fritter sliders) made lively by a trio of piquant house chutneys; the crisp dosa is filled with roasted onion, green tomatoes, serrano chile, and paneer, accompanied by sambhar and coconut chutney; the beet chaat is a vivid mélange of Spade & Clover field peas, cashew chutney, and fresh dill. What matters is on the plate. And Walker is dedicated, if not obsessively so, to learning about the history, ingredients, techniques, and migrational influence integral to faithfully preparing Indian fare (as much as one can without ever visiting the country from which these dishes originate). His attentiveness suggests a reverence for both taste and place, in details like using Spade & Clover’s locally grown turmeric, or by ordering whole spices from Spicewalla—an Asheville-based company founded by James Beard nominated Chai Pani chef Meherwan Irani—before grinding and adjusting house blends to his satisfaction. The upside of Walker’s liberal but informed riffing is that you can eat through a culinary greatest hits list of dishes plucked from vastly different destinations in one sitting. What rarely shares the same real estate on a menu in India appears harmoniously together at Tu. For example in, say, North India’s Delhi, you can score a superior butter chicken, but you’d be hard-pressed to find an exceptional vada pav (potato fritter slider), which originates from Mumbai. You can get both at Tu, along with fresh bread service and a hot milky chai that puts boxed, saccharine café latte concentrate to shame. Walker’s vada pav, in particular, is a marvel morsel. Made with pillowy, sweet milk bread, doused with spicy green chili, tamarind, and coconut chutneys, this sandwich is best eaten quickly and piping hot; though two come in an order, you may want to devour both, in silent wonder. Warehouse glass, globe lights, and an oculus window give the feel of a mod cantina. 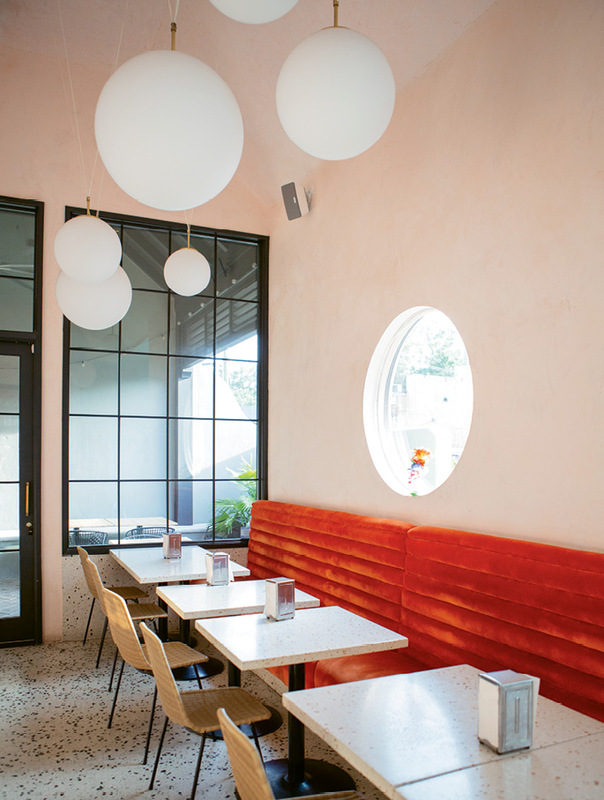 Another upside: you can enjoy these items in the airy and winsome main dining room that boasts terra cotta-colored velvet banquettes, mid-century rattan chairs, warehouse glass walls, and one alluring oculus window. Additions like the leafy Ficus benghalensis (the national tree of India), cheery neon plastic lotus flowers, and suspended globe lights offer festive flair that befits the food. Vibrant on the eyes and palate is the chaat, a popular snack found at roadside food stalls in India. Walker’s beet version is floral and bright, with crisp-fried purple-eyed peas; local greens; and a turmeric, dill, and cashew chutney. The tikka wings, available during lunch and dinner, are tiny flavor bombs, detonated with a dry-spice house masala mix, then quieted by a generous pool of tangy yogurt. 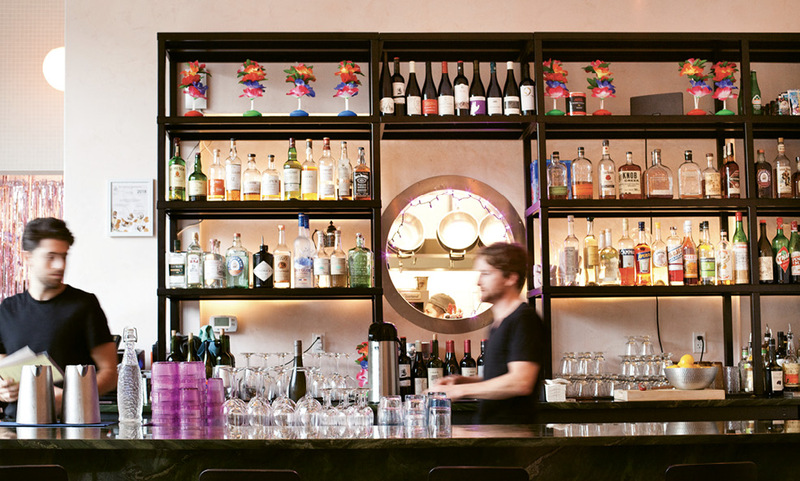 Knowledgeable servers will field all manner of questions; they're well-apprized of everything from wine pairings to crucial ingredients like hing: a pungent, wild allium resin used as a balancing agent in Indian cooking. With any measure of experimentation, there will be downsides. If a dish is labeled raita, you’re going to expect a yogurt sauce that serves one function: to cool the palate. For a while, Walker concocted his with pureed pumpkin, squash, fried onion, and nutritional yeast, resembling pimento cheese and tasting like Neufchâtel. He has since recalibrated to a lighter, more traditional adaptation with cucumber and shallot confit—implying perhaps he, too, can appreciate that some classics are better left alone. Beverage director Joey Ryan (center) mixes flavors from around the globe, from loquats to Czech fernet. Overall, Walker’s gutsiness pays off. You will not likely encounter a better dosa within a 100-mile radius. Tu’s crèpe-like pancake, made with fermented rice and split black lentil batter, is filled with paneer (a fresh, mild Indian cheese), crisped on a flat-top, rolled into a tube, and served with sambhar (a South Indian lentil stew). The latter element, like Walker’s daal (cooked and spiced lentils), are staple dishes simple to make but difficult to perfect, even in their dozens of regional iterations. To do so requires experience; not the restaurant-world kind, but rather the depth of knowledge aunties or grandmas possess—a sensibility least easily replicable in ethnic food. My Korean mother calls this sohn-mat, or “hand-taste,” feeling flavor through touch and sight, a synesthesia no recipe can properly convey. In this sense, Tu’s menu is aspirational. That hand-taste can only deepen with time.